As the temperatures have dropped during the winter months, you’ve no doubt been spending less and less time outside. You’ve certainly not been doing any gardening, and you’re probably not thinking much about your trees, either. However, though you may want to hibernate all winter, if you want your trees to be healthy and strong this spring, you’re going to need to do a little bit of care and maintenance. Trees go dormant in the winter months, and a lot of people make the mistake of thinking they should leave their dormant trees alone. Actually, this is completely wrong. Pruning your trees in the winter, when they are dormant, is a much better plan than pruning them in the spring when they begin actively growing again. Cutting branches and foliage from actively growing trees can damage them by disrupting the flow of sugars and carbohydrates that the tree is producing and sending through its branches to its budding leaves. When you prune a dormant tree, you’re going to notice less sap leakage and less damage. For most of the country, winter comes with harsh, gusting winds and light to heavy snowfalls. You probably already know that both snow and wind can really damage your trees. Just the weight of a heavy snowfall on your trees’ branches can cause them to crack or cause existing cracks to become larger. This can easily result in broken limbs and branches, which could cause major stress and damage to your trees. By pruning your trees when they’re dormant and before the snows come, you’ll significantly decrease these risks. We highly recommend hiring an arborist to take a look at your trees this winter. Whether you’re doing the pruning yourself or hiring someone to do it for you, an arborist can look at a dormant tree and see damage or potential issues that you’ll have to deal with in the coming warmer months. Let your arborist come out and prune your trees for you, or call them to inspect your trees after you’ve done your pruning yourself. Either way, you’ll be much more likely to catch any problems before they become catastrophes for your tree and for the safety of your property, your family, and yourself. Unfortunately, trees are susceptible to diseases that can kill them and cause major issues to you, even if you’ve done everything right in caring for and feeding them. However, by pruning your trees in the winter, when they’re dormant, you can actually diminish the chances of transmitting dangerous and deadly diseases like ash decline, oak wilt, and/or Dutch elm. Want to further ensure that you don’t transmit diseases from one tree to another? 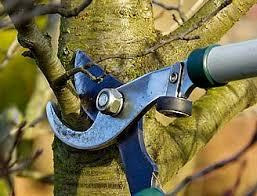 If you’re doing your pruning yourself, be sure to clean and disinfect your tools before you do your pruning. You can do this by washing them and then wiping them down with a 10% alcohol to water solution. If you’re nervous about diseases or about harming healthy branches and limbs, don’t hesitate to call a qualified arborist (http://www.growingearth.com/contact-us/). Even if you’ve done all of your pruning already, if you notice anything that looks “off” about your trees and/or you’re concerned about infection, a professional can inspect your trees, diagnose problems, and make recommendations for fixing them before they become serious issues and dangers to your trees, your property, and your safety. Whether you do it yourself or call a professional, prune your trees this winter, and you’ll see a lot more growth and health this spring and summer.